This paper examines the relationship between some scholia to the IIId book of Plato’s Republic, Proclus’ commentary on it, and the so-called Chrestomathia, a work that the manuscripts attribute to the Neoplatonic philosopher himself. The conclusion is that the relationship between the three texts is highly problematic, and that we cannot think of a simple and direct derivation from one another. The author of the scholia probably made use of texts different from those that have come down to us, or alternatively he has reworked his sources in a personal way. 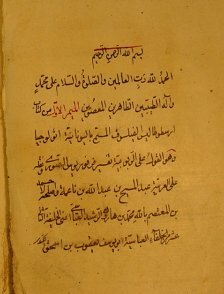 The Arabic version of the Enneads is the earliest datable text in which appears the term "anniyya", that features in Avicenna’s metaphysics and lies in the background of the Latin definition of the Causa prima as esse tantum, typical of the Liber de Causis. This paper examines some examples of the use of "to be" in the Arabic translation of the Enneads. It also discusses the description of the First Cause as ‘pure Being’ or ‘first Being’ in the Arabic Plotinus, and compares it with the Divine Names of the pseudo-Dionysius. This paper examines the Treatise on the "Difference between the two fields of philosophical logic and Arabic grammar" (Maqāla fī tabyīn al-faṣl bayna ṣina‘atay al-manṭiq al-falsafī wa-l-naḥw al-‘arabī) by Abū Zakariyā’ Yaḥyā ibn ‘Adī, providing also the Italian translation of it. It will appear that Yaḥyā ibn ‘Adī’s approach is based on Fārābī’s ideas about the relationship between logic and the sciences of language. Even more important is the fact that the difference established by Yaḥyā ibn ‘Adī’s between logic and grammar both as for the subject (mawḍū‘) and as for the scope (ġarad) counts as the source for Avicenna’s distinction between subject (mawḍū‘) and scope (ġarad) of the metaphysics.